Sequel 3 has everything you need to make your ideas fly and shine in the best most possible way. Plus, it’s easy to use: recording and performing music is as intuitive as you would like it to be, and comes with an array of quality recording and editing tools you wouldn’t expect in an entry-level workstation. With Sequel, every time you flip on your Mac or PC, your computer turns into one massive sound studio: synthies, drum kits plus guitar amps, cabs and stomp boxes at your fingertips. Take it along to band practice, record the lot and head on back home to give it a professional makeover. The many tools at hand help you to adjust tempo, pitch and stretch audio or use the onboard effects to create insane sound combinations. By supporting Virtual Studio Technology, you can continue to add to the number of effects and instruments - providing endless possibilities, easily controlled using your MIDI keyboard. In fact, use MIDI to trigger parts of your arrangement when in performance mode and play your track in different ways. It’s really an all-in-one solution - Sequel 3 lets you create, record and perform music, it also helps you on your way to become a star. Rocking out of your computer has never been more fun. Grab your six-string, plug into your box running Sequel 3 and jam until your fingers fall off. Boasting an arsenal of virtual amps, speaker cabinets and effects pedals, the VST Amp Rack SE is one powerful guitar amp simulator that’ll dish out any gnarly sound you want. One of the many Sequel features that make you go absolutely wild with your music is Tempo Detection: remix your track in real time or put together another mixtape of some of the long forgotten gems buried deep down within your music library. But now for giving your tunes a serious groove: the Beat Page shows off a battery of opportunities thanks to its easy-to-use Groove Agent ONE and Beat Designer, great tools for creating custom beats that’ll stand out and set you above the rest. So powerful yet simple and straightforward to use and understand, Sequel 3 comes without any restrictions to your creativity and lets you do what makes you happy, and that’s making music. Overflowing with premium content that spans more than 5,000 loops and sounds, Sequel 3 lets you get started with making music in next to no time. Play a hook, add a bassline and give it some depth by choosing from the many available pads, all easily accessible through the acclaimed media management too, MediBay. Choose Step Envelopes to tweak loops or use elastique Pro, high-quality time stretching and pitch shifting tool, to adjust tempo and tone in stunning audio quality. Thanks to Virtual Studio Technology (VST), Sequel 3 includes an array of top-notch effects and instruments. And with VST boasting compatibility with all the high-end gear out there, you can pretty much hook up anything you like. 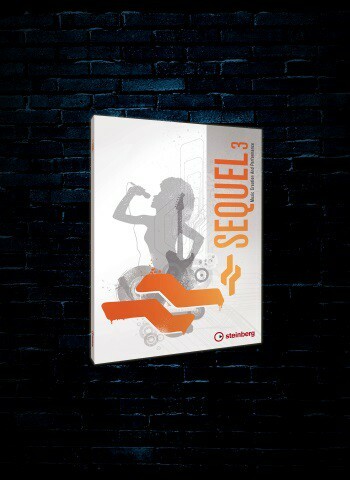 Sequel 3 gives you studio-grade quality that everyone will hear and enjoy.